The A14 skirts the west and south of the town, links the town with the A45 dual carriageway, M1 and M6 motorways. The A43 links Kettering with the county town of Northampton and the A509 (Kettering/Wellingborough Road) links Kettering with Wellingborough. Corn Market Hall is based in the Centre of Kettering town. It has the benefit of a large car park run by the Local Authority with ample parking for all customers who use our facilities. Disabled parking bays are also provided right outside the main entrance. The Town is also served by a local bus network under the brand name Connect Kettering with routes A,B,C,D, E and F linking the town centre with local suburbs and Burton Latimer. Leaving every 30 minutes, the X4 service links the town with Milton Keynes, Northampton, Wellingborough, Corby, Oundle and Peterborough. 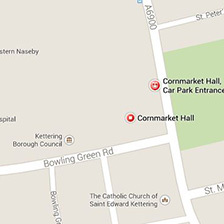 The nearest train station to the Corn Market Hall is Kettering Station, a five minute walk away. Located in the Midlands, kettering station benefits from havine a direct line to and from London and also links to the North and South.